Hello, my name is Indica! 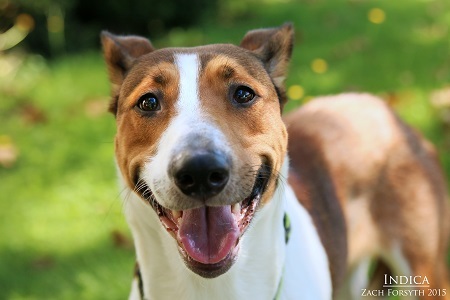 I’m an intelligent and athletic 2 year old Collie mix that is looking to be a dynamic and important part of your team, er…household! Let me give you the skinny on my resume, my pros include being highly treat motivated and eager to learn. I work well in a fast-paced environment and am great with problem solving. My only weakness? I require training to channel all of my smarts! Since I need a strong role model I will be best in home with an experienced dog owner who is interested in extra-curricular training, maybe sheep herding or nosework, perhaps? I am good with other animals and best in a home without small kids (again, since I need some training I’ll need to be the center of attention for a little while!) . What do you think are you the one to give me a job and a home? Fill out the adoption application so we can schedule a meet and greet. I am fixed, vaccinated and microchipped. My adoption fee is $250.